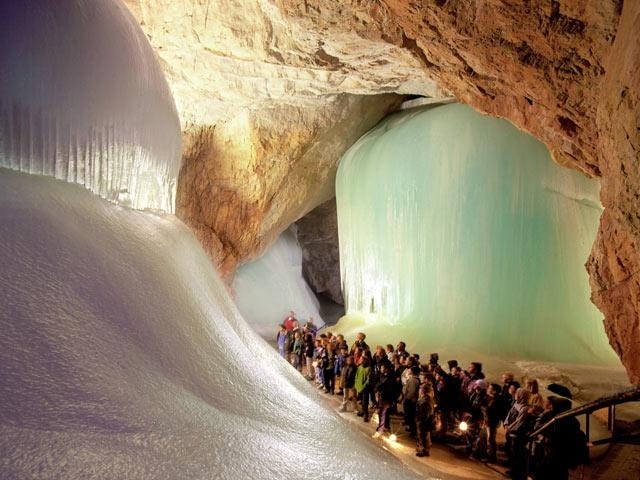 The Eisriesenwelt (German for "World of the Ice Giants") is a natural limestone ice cave located in Werfen, Austria, about 40 km south of Salzburg. It is the largest ice cave in the world extending more than 42km. Eisriesenwelt Cave was created by the Salzach river as it flowed through the mountain eroding passageways nearly 100 million years ago. Over the course of thousands of years cracks and crevices in the limestone became more developed as water eroded the rocks away. In winter, when the air inside the mountain is warmer than outside, cold air streams into the mountain and reduces the temperature of the lower areas of the caves to below freezing point. In spring the water from melting snow seeps through the cracks in the rock and when it reaches the colder lower areas of the caves it freezes and turns slowly into the wonderful ice formations visible inside the caves. Although the cave has a length of 42 km, only the first kilometer, the area that tourists are allowed to visit, is covered in ice. The rest of the cave is formed of limestone. Since the entrance to the caves is open year-round, chilly winter winds blow into the cave and freeze the snow inside. In summer, a cold wind from inside the cave blows toward the entrance and prevents the formations from melting.